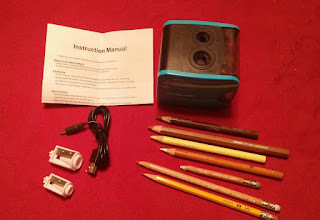 Review for SMARTRO Electric Pencil Sharpener. I have been sketching with the NYC Urban Sketchers for about 5 years, and through the duration, I have been experimenting with many brands of colored pencils. I have come to prefer pencils with a very high chalk content. They are brighter and deliver more pigment to the paper, leaving more vibrant color, than can be delivered by a pencil that has wax binding the pigment together. The down side of chalk pencils is that they become dull very rapidly and it is impossible to sharpen them with any manual pencil sharpener. They must be sharpened carefully with a small knife or with sand paper. The colored chalk does not have enough strength to survive being twisted in a manual sharpener. I have tried several brands of manual portable sharpeners, and the point always breaks off inside the sharpener. The chalk pencils can be very nicely sharpened in a desktop version of an electric sharpener, but that doesn't work for Urban Sketching. The other problem that I experience when sharpening art pencils in a standard office style electric sharpener, is that the art pencils are too large. In late December 2017, Amazon advertised as one of their daily specials the Smartro portable electric pencil sharpeners that can be powered by either batteries or an USB cable. It was available for $28.95. I decided to try it out and have been pleased so far. It took 10 days to arrive. The first surprise is that it comes with 4 pencil sharpening blades -- 2 of each size. The photo below shows the Smartro after two of the blades are installed and I have sharpened a variety of pencils. So far, I have only used it in battery mode. 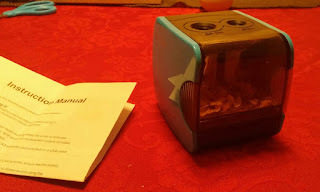 It uses 4 AA batteries. It took less than a minute to install the sharpening blades and make the sharpener usable. I have been very impressed by how well it sharpens my extra wide pencils. They have never been sharpened better! Its size and weight are modest. I would describe it as being about 3 times the size of a typical portable pencil sharpener. It fits in my art bag easily. So far, I have used it while sketching in 2 museums. In both cases, the guards came and stood beside me while I used it, but left with smiles. It is very sturdy, and there is no chance of the shavings spilling out either during use, or during transit. I am very satisfied with its performance.